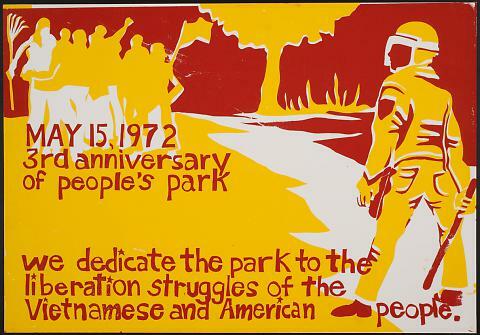 Small poster with yellow silhouette of a crowd holding a rake and a flag on the left and a police officer in the lower right. The sky is red and has a yellow tree outline. The poster reads in red, "May 15, 1972 3rd anniversary of people's park/ we dedicated the park to the liberation struggles of the Vietnamese and American people."